I’ve been hunting around for some decent vegan yoghurt for months. Like cheese, I have tried them all and found them badly wanting. I knew I’d have to make my own. My first stop was to make some soy yoghurt. After a lot of searching I found a source of non-dairy yoghurt culture (the SYAB1 strain) at Green Living Australia. It even comes with a statement from the manufacturer in Italy that the culture is vegan. So far so good. I was wildly excited. Yoghurt is something I have missed so much. 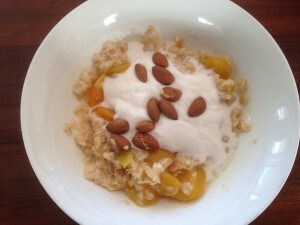 Prior to giving it up, it was something that I ate most days for breakfast with fruit and almonds. My first attempt seemed to work. It set encouragingly, and though it did look an unappealing beige/grey colour I could live with that. Unfortunately it tasted horrible. I thought perhaps I should try some different soy milk (in the end I tried four, including home made soy milk) – all were a failure. I also tried a recipe that used silken tofu. Bzzz. If this was vegan yoghurt then it looked like I was going without. Next stop was back to try another commercial variety – the Babushka Coconut and Almond yoghurt. Horrible and with a scarily long list of strange ingredients. Sorry to anyone who likes this. Then at a recent vegan dinner with some friends someone mentioned COYO coconut yoghurt. I dashed out the next day and bought some. I’m in love. It goes well with fruit, it doesn’t contain a long list of questionable ingredients and it tastes good. But at $10 for a 400ml tub it is a luxury. So armed with my non dairy culture, a couple of cans of Aldi coconut cream, some pectin and my EasiYo yoghurt maker that’s been gathering dust, I made a litre for less than $2. My first attempt was a bit thin, so I looked at the COYO ingredients list which includes some tapioca starch. The recipe comes from the Green Living Australia website, tweaked with tapioca starch slightly to thicken it up.